Wildeheart was not my first character in World of Warcraft but she has been my longest running main spanning two regions and six going onto seven expansions with Battle for Azeroth. 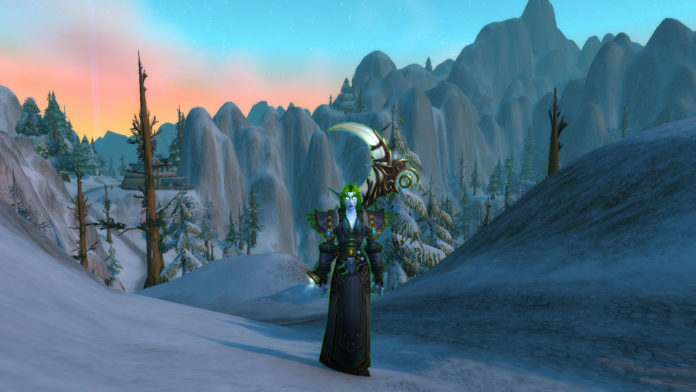 Wildeheart started her adventuring life at the end of Burning Crusade. I used to love PvP I would always be running to defend Astranaar, pressing the assault on crossroads or defending the Alliance hold on Halaa! If the world defence warnings popped up I paid attention. At this time I was still playing my very first character. Her name was Shaika a Night elf Hunter. I was also running Battlegrounds with my Retribution Paladin Tyraahl. My first love in World of Warcraft though was raiding on my Draenei Priest Kayleira. Nothing was more enjoyable than trying hard to beat some big nasty with a fantastic group of people who were there just to have fun. Downing bosses and better gear where important but having fun was the most important part and for that foundation of what raiding should be I will for ever be grateful to the fine people that made up my guild Saints and Sinners. Thank you! During this time I was also into watching WoW arena tournaments and Hafu a Restoration Druid made a huge impact on me. Her healing in Arenas inspired me to combine my love of raid healing with my love of PvP and with that Wildeheart was born. Unlike my Priest I decided to take it easier with levelling. Whilst battling in Halaa a Horde Feral Druid kind of became my nemesis. He was a lot of fun and we would often spend a battle in Nagrand trading kills back and forth. I would always be on the lookout for him whenever I was there and with how things played out I kind of felt he was doing the same. Whatever the truth of that situation was his skill was my entire reason for choosing Feral as my levelling/open world spec. I managed to level her completely by the end of Burning Crusade and since I was really enjoying playing her in most aspects of the game I decided to main her completely in Wrath of the Lich King. Real life has a way of mucking up plans sometimes and for my gaming it meant I had less time to dedicate to organized play but it was ok. Life outside the game was going well and inside game I was more than happy to continue casually enjoying both PvE and PvP equally. Towards the end of Wrath of the Lich King I met someone in Second Life of all places and we just clicked. After some time our relationship blossomed and grew till we decided it was time to make things official. We decided it was better for me to move to Scotland where we had our civil partnership, now marriage since it became a legal option, and have been together for over eight years. When news came out about Cataclysm I got really excited and began investing more time in WoW. I tried to continue playing on the US servers but time differences and real life commitments made it far too difficult to maintain. I made a tough decision and changed regions. This was really hard for me as, even to this day; it means you lose all progress, collections and achievements you’ve made. Characters are never the issue as they can be remade. It is the history that we lose that hurts. RiP my beloved Big Blizzard Bear! To be fair it was not all doom, gloom and nightmare. There were some very positive experiences like roleplaying in WoW. I have a deep rich history of Pen and Paper roleplay. I spent some time on Defias Brotherhood an RPPvP realm and had a grand time. Wildeheart grew, she had history and I tied her story closely to everything I had and would experience in game. It gave her purpose, meaning and I was able to resolve most of my discomforts with playing on the Horde side through her story! To me it was brilliant as with all characters I create there is some rough framework of who they are. Quite similar to how one creates a character for pen and paper. It was amazing! I did, and still do, struggle a lot with RP in WoW. Reading for me is a mutually exclusive skill with everything. Meaning when I read I am literally incapable of any other act including listening. At the end of Warlords of Draenor I had so much time on my hands I was able to make a full roster of Alliance characters on Argent Dawn EU. During the levelling of them I was having so much fun I decided to make a return to Alliance. If it wasn’t for a dear friend I would have changed back for Legion. Also if it wasn’t for that same dear friend I may never have met the fine folks of Failtrain EU. I had found some joy in the game again and began completing achievements and looking for things to do. Still all through Legion I felt plagued by this nagging feeling I could not shake. Now I had long ago lost my joy in PvP and with the end of Legion coming I still had not done anything to complete the Prestige rewards. The towers were the easy answer but battling at them I realised one of the reasons I had stopped PvP. I did not enjoy killing Alliance yet as with anything if you want the rewards you do what you must besides I could just ignore what I had to do; it’s just a resource farm yea? Well when I realised how much honour was going to be needed I looked into alternate methods and found my best course of action was to do the towers, any pvp dailies and… Oh who was this NPC in the sewers? Oh yea that’s right I can try this mercenary mode! The first battle sealed it for me. The snows of Alterac Valley were red with the blood of the defilers once again! My decision was made. I had found my joy in all aspects of this brilliant game once again and was beyond happy. On the 6th of May, today, Wildeheart will return to the Alliance. I feel free and am looking forward so much to Battle for Azeroth as the character I love and the Faction I have missed for years. Thankfully my Horde guild has an Alliance counterpart! With all the good vibes from them and the Failtrain EU community the Future is looking long and bright for me and my lovely main in World of Warcraft! Thanks for sharing your story 🙂 Now I know you a little bit better! Oh, I wish they could make a catch up mecanic to Prestige. I am not one that expects to get things for free, but they did so with AP etc. in Legion, right? Starting out now, just makes Prestige 25 seem so far away. 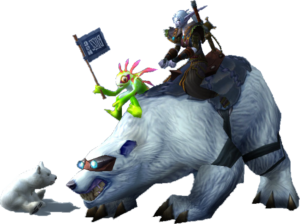 I still poke Blizzard at least once a year bout the whole cross region issue and moan at them about my Bear. I am sure they are thoroughly sick of me by now but I will keep poking. With Prestige there is definately no catchup mechanic coming. It is instead being converted to an infinite progression system where there is no level cap and is purely there in the background to show your PvP participation over time with a few rewards to encourage people into PvP activities. Since it is not being removed any rewards you are after you can get in your own time. Further the system will be account based so any charcter you PvP on will add to your accounts Prestige progress. The Fail Train EU renewed my faith in the community. I found them at a time where I was sick and tired of pug groups hating my hunter for the sole reason of me playing Beast Master spec. I wanted to do the raids on normal, but groups were so elitist and toxic. Thank you! Fail Train has done so much for my enjoyment of the game as well. I cannot thank them enough. For anyone that is looking for a great open community that believes in a friendly and relaxed environment please feel free to join Fail Train EU’s Discord https://discord.gg/VsEFRHh and check out their #information channel.